Kyocera boldly ventures forth where no smartphone has ventured before with the dual-screened Echo. Kyocera attempts to answer a question that has plagued humankind since the beginning of time. 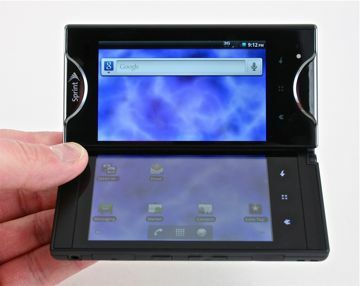 The Kyocera Echo, with its dual-screen design, boldly goes where no smartphone has gone before. Do you dare follow it? Only the adventurous soul seeking a radically new smartphone experience need apply, as Kyocera sets out to prove if two displays are truly better than one. Our hands-on impressions of the innovative new Kyocera Echo Android smartphone for Sprint. See what dual screens can do for you. Sprint and Kyocera today announced the Echo, a new Android 2.2 smartphone that has a unique, two-display design. The device has dual 3.5-inch displays that are attached to a pivoting hinge, allowing one display to be hidden behind the other or both displays placed next to one another. Kyocera has confirmed to Phone Scoop that a software update will be distributed to the Echo smartphone starting today. The device brings most features of Android 2.3 Gingerbread to the Echo. Kyocera today launched the Kyocera Android Developer Program, which it hopes will entice developers to target its Android devices, such as the dual-display Echo. The program contains the tools developers need, such as a software developers kits, so that developers may create applications optimized for the Echo and its two displays. Sprint today announced that it will offer the Kyocera Echo dual-screened Android device for sale starting April 17 for the price of $199.99. It will be available on all Sprint retail channels on that date. --it's clunky, squared off & huge. But it's still frickin' cool. "The Echo is the first handset that can honestly and truly multitask, as far as I am concerned"
No matter how hard you bash Windows phone or iOS, NO PHONE truly multi-tasks unless you can actually USE two apps at the same time like on a computer. It would be fun to see a better manufacturer produce a phone like this... HTC??? Kyocera might not be at the height of fashion, but they have usually built solid devices (7135, anyone?? ).